One of the most misunderstood and oft-caricatured jobs in British politics, whips are the unseen, unsung heroes of the parliamentary system, without whom governments would doubtless crumble and legislative business would almost certainly grind to a halt. Whips are shrouded in mystery, however, often portrayed in the media and by colleagues as a brutish, bullying bunch of thugs with a reputation for using blackmail and torture to achieve party discipline and get legislation through the House. 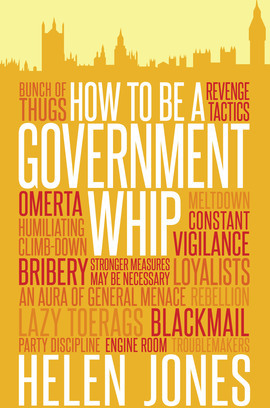 How to Be a Government Whip is a frank and light-hearted guide to the forgotten engine room of Parliament, perfect for those who aspire to be amongst their ranks as well as those just hoping to avoid them. From the mind-numbing tedium of debates to the dark arts of dealing with rebellious or disaffected members of their ‘flock’, former whip Helen Jones reveals how they really get business done – and what they say about their colleagues behind the closed door of the Whips’ Office.